When buying wedding favors on-line be sure to accurately read the descriptions and order a single item first before placing the full order to be sure that you like them. For example, you may have your heart set on an original “Murano” Letter Opener bomboniere complete with certificate and this is what you think you’re getting. But if you go back and look at the description again it says that what you actually purchased was a “Murano like” Letter Opener wedding favor you might be disappointed. The imitation is just as beautiful but less expensive than the original but you still may want the original. If you wish to return them you now have to pay the shipping costs again. You will have paid the shipping costs twice and don’t have bombonieres to show for it. Now, another example is personalized playing cards. The description says that it is a personalized sticker that is placed on a hard plastic cover but you assume that each card is personalized. Be careful because they are still considered personalized wedding favors and cannot be returned. Read, re-read and if you’re still not sure just pick up the phone and talk to someone in person. In Canada and the U.S. the call back time should be relatively short if not immediate. When selecting wedding favors for your event remember to keep in mind your theme, colors, interests and whether or not they are suitable for all guests. You want to pick a wedding favor that your guests will say “I remember” every time they look at it. “Present the Perfect Thank You” to make the memories of your special day last forever. These Heart Shaped Measuring Spoons add Love Beyond Measure ® as wedding shower favours, wedding favours and more. Certain to capture your guests` hearts, these charming – and usable – heart shaped measuring spoons add just the right touch as wedding shower favours or wedding favours. Approximately 5¼” long and made with high-quality stainless steel, these measuring-accurate heart spoons are engraved with traditional measurements on one side and loving notations on the other – “A pinch of joy” – “A dash of tenderness” – “A spoonful of affection” – “A heap of love.” These delightful and practical wedding favours / wedding shower favours come beautifully packaged in a matte black box with clear top, white organza bow and a heart-shaped Love Beyond Measure ® tag. At home in any kitchen, our sweet heart shaped measuring spoons are sure to elicit fond memories every time these great wedding shower favours or wedding favours are used. Buy Now. Love has an intimate and cozy feel when you are sipping from these Dainty Espresso Set Bombonieres (also known as Bonbonnieres). The perfect bomboniere for that special Italian event. Whether a Wedding or Shower, these Espresso or Tea Time favors are a practical gift for all to appreciate. Any time of the day is the best time to sit back, relax, remember the day and enjoy that hot espresso or tea for two with someone special. See All Espresso Sets or Tea Time Bombonieres. Friends and family will absolutely “Love” these dainty yet elegant Espresso Set with Pot Wedding Favors . Complete with matching design PVC top gift box for easy storage, the delicate shape cups in this tete a tete will surely remind your guests of your special day. Each cup and saucer bonbonniere is made of fine white porcelain and decorated to fit any home decor. These Espresso Set with Pot Wedding Favors come complete with ribbon and “Thank you” tag. Each of these Espresso Set with Pot Wedding Favors measure: Cup 2″H 2″D. Buy this now. Love, Amore, Amour, Amor…are key words to anyone’s heart and these “Love” Espresso Set Bombonieres make the perfect wedding or party gift. In bomboniere tradition, these beautifully set espresso cups and saucers script “Love” in multiple languages including English, Italian, French and Spanish and have universal appeal. Gorgeous detail with shades of silver and raspberry red heart accents make these “Love” Espresso Set Bombonieres more than a practical favor, but an artistic piece worthy of your guests home display cases. Whether a keepsake gift for your one and only or all your wedding guests, these “Love” Espresso Set Bombonieres will be the talk of the party. A brilliant gift idea or favour for Valentines Day parties, too! Perfectly matching Thank You tag is included along with coordinated display packaging finished with sheer organza ribbon and bow. Made from ceramic. Packaged favour dimensions approx. 7″ x 2.25″ x 5.25″. Buy this now. Dangle these romantic Crystal Heart Key Chain wedding favors in front of guests, as an unforgettable bomboniere highlighted by Choice Crystal. A “key” ingredient to your wedding or shower should be these lovely 3¾ x 1 x ½ chrome key chain favours. The 3-dimensional Crystal Heart Key Chain wedding favors are timeless reminder of your love and your wedding celebration. Perfectly packaged in a silver deluxe 4½ x 2 x 1 1/8 box that is accented with a heart design, organza bow and attached heart-shaped thank you tag. Buy this now. These sparkling heart shaped crystal beauties are sure to catch your guests’ eyes and capture their hearts when they arrive at your event and find their seating assignments so lovingly displayed. Each exclusive Crystal Heart Place Card Holder wedding favorsmeasure 4 ¼” x 1 ¾” and features a glistening multifaceted heart shaped crystal glass base with a silver metal wire extending upward to form a double heart place card holder. These favours are also perfect for holding photos, notes and more. A winning bomboniere choice for weddings, showers or any occasion where you want to show your guests some love, these Choice Crystal Heart Place Card Holder wedding favors come bulk packaged in a poly bag and a blank place card is included. Buy this now. The Choice Crystal Collection kissing swans are favours you can really put your heart and soul into. Add an enchanting touch of elegance to your event with these charming Crystal Swans wedding favorsfrom the Crystal Choice Collection. Each crystal favour measures 2 1/8” long x 1 1/2″ tall and features two swans, with multifaceted bodies, locked in an embrace with their graceful long necks forming a beautiful heart shape, with a frosted glass heart embellishment at their center. These bombonieres are sure to wake the inner lovebird in everyone. These Crystal Swans wedding favors make for a stunning presentation inside a Choice Crystal signature silver box decorated with white hearts, wrapped with a white organza and satin bow with a crystal heart accent on top and an attached heart shaped matching design “For You” tag. Buy this now. • Bomboniere gift box measures 5 3/4″ h x 2 1/2″ w x 1/2″ d. Buy this now. No matter how you slice it, there’s simply no topping these “A Slice of Love” Pizza Cutter wedding favors! Place “A Slice of Love” Pizza Cutter wedding favour next to each table setting, and when your guests go home, they’ll take a “pizza” your heart with them—in a deliciously designed pizza box! White, protective, plastic grip says “A Slice of…” just above a saucy, red heart, with the letters L-O-V-E appearing as openwork on the stainless-steel cutter. 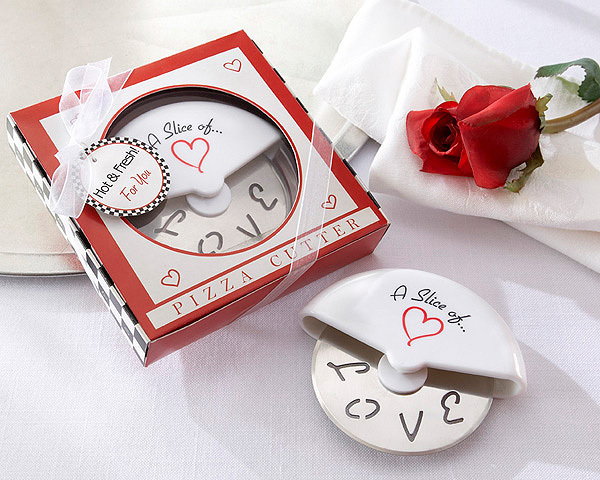 Each of these “A Slice of Love” Pizza Cutter wedding favors are cleverly packaged in a miniature, red-and-white pizza box with black-and-white checked sides and a circle of clear cellophane on top that lets the pizza cutter peek through. These “A Slice of Love” Pizza Cutter wedding favors measure 3 ¾” in diameter. Buy this now.